Click below to download the updated weekly bulletin. Click image above for access to new faith formation opportunities! Please return your updated census sheet to the parish office or through the collection basket. We need everyone’s correct infomation so that we might serve you as best as we can. If you have any questions, please call Rita Mayor at 937-570-6793 or email the parish office at stteresacovington @yahoo.com. Thank you so very much for your help! ** Lenten Schedule: 6:30 pm - 8:30 pm. We will begin each meeting at 6:30 to lead the parish in the Stations of the Cross. April 21 - No meeting. We are an Easter people and Alleluia! is our song. April 28 - AWAKE! 6th - 8th Grade retreat. Meet at St. Teresa at 4:00 pm. Cost is $15. The event is open and accessible to any 6th - 8th grader and will feature a meal, entertainment, music, games, small group conversation, a keynote testimony, Eucharistic adoration, and the opportunity for the youth to receive the Sacrament of Reconciliation. Please contact Alan Capasso if you are going so we can arrange additional transportation, if needed. No High School meeting that day. have decided that “Jesus deserves better than artificial flowers.” If you would like to help, they are looking for any and all donations to keep fresh flowers in the sanctuary. Thank you! 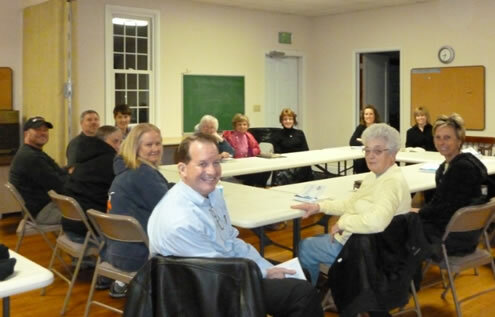 The St. Teresa Community Life Committee will meet on Tuesday, February 12th at 6:30 pm. View a complete calendar of dates the Sports Complex is rented to determine what dates are available for your event. Adult education classes are offered periodically and sometimes coincide with R.C.I.A. Our weekly bulletin also lists local events, seminars, and programs for anyone interested in attending. St. Teresa offers R.C.I.A. (Rite of Christian Initiation of Adults) for non-Catholics who wish to join the Church. Anyone interested in R.C.I.A. should speak with the pastor on how to begin. St. Teresa’s Church offers religious education instruction to all children on Sundays. The ages range from pre-school (4 and 5 year olds) through 12th grade. The curriculum used is RCL Benzinger’s, “Faith First  Legacy Edition”. Teachers are volunteers from the parish. Would you like to Volunteer? © St. Teresa Catholic Church. All Rights Reserved.